The jury in the Hatfield rail crash manslaughter trial has visited the stretch of track where a train derailed in 2000, killing four people. The 11 men and one woman were shown around the Hertfordshire site before trains started running. The jury members were shown plans and photographs of the scene on Friday to help familiarise them with the area. Five rail managers deny charges of manslaughter and further charges under the Health and Safety Act. Sunday's visit began at around 0730 GMT, while trains were undergoing general maintenance. The jurors were issued with clipboards so they could take notes as they inspected the scene. BBC transport correspondent Tom Symonds said it was "pretty unusual" for a jury to visit the scene of an alleged crime. "But now they've been here, they will have to spend the next year deciding whether this tragedy was caused by what the prosecution has described as gross negligence," he said. Mr Justice Mackay, who also visited the scene on Sunday, told the jury soon after the trial started that they would see the site for themselves, in addition to video footage and photographs of the scene. "There is not much substitute to seeing it through the soles of your feet and having a walk down it," he said. A rail accident investigator who visited the site soon after the derailment was called to the Old Bailey, where the trial is being held, on Friday to help familiarise jurors with the track, with the help of plans and photos. Alistair Cook, 50, Sean Fugill, 50, and Keith Lea, 53, three executives from Railtrack, which owned the East Coast Mainline at the time of the derailment, and two from engineering firm Balfour Beatty - Anthony Walker, 46, and Nicholas Jeffries, 53 - deny all charges against them. 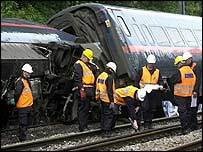 Robert Alcorn, 37, from New Zealand, Steve Arthur, 46, of Pease Pottage, West Sussex, Leslie Gray, 43, of Tuxford, Nottingham and Peter Monkhouse, 50, of Headingley, Leeds, were killed on 17 October, 2000, when a London to Leeds GNER express derailed. More than 100 people were injured. Survivors of the disaster were called as witnesses at the trial last Monday.